Did you know I did commissions? Well I didn't, but people started asking about them so I opened myself up for a few. 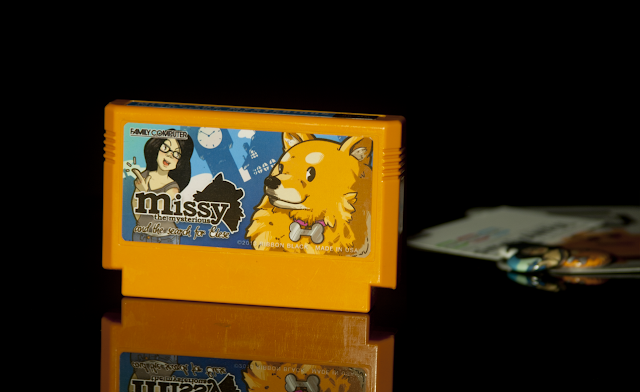 A nice gentleman asked if I would make a fake game for wife and featuring his dog Missy in the same vein as puzzle adventures like Professor Layton or Famicom Detective Club. I hadn't been able to do anything retro game related in ages and was happy to oblige. He asked that it be similar in style to my Adventure Time and Bug x Kick** labels. As far as commissions go, this kind of cartoon style illustration is my standard thing, but I'm also open to pixel style labels and more "painterly" illustrations similar to Once In A Century. This is what I've been sending with commissions--my button maker is finally coming in handy! 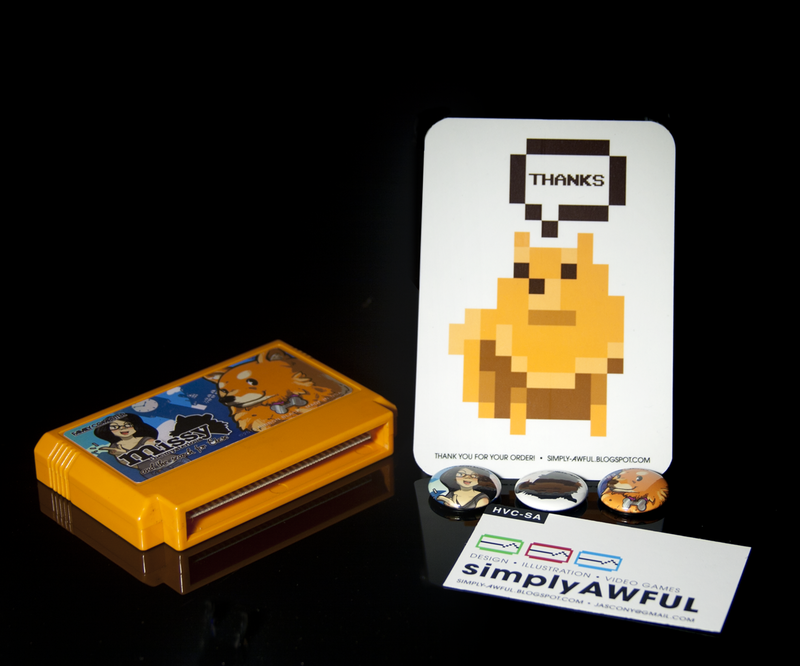 Also included is a thank-you card with sprite I made representing what the game's graphics would be like if it were real. 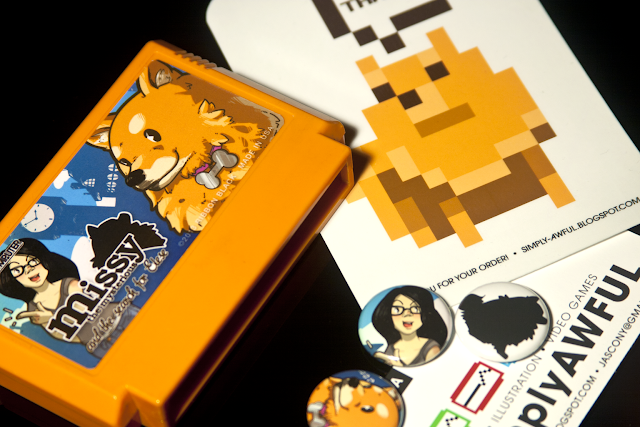 I also throw in a business card based on the cartridge in my header image. I'm thinking of changing my name to "Ribbon Black", though. 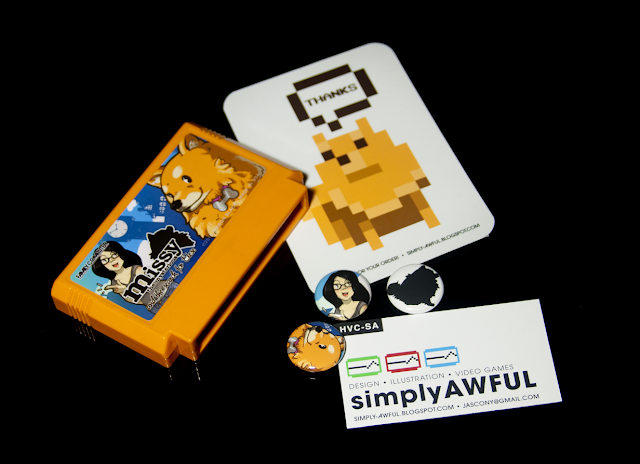 That's the name I've been using for ages for other projects of mine, and "simply awful" sounds enough like "something awful" that people have been getting confused. Probably should have thought of that, considering I've been reading Something Awful since 2000. Things have been so busy this season I haven't been able to do much for the blog, so it's nice to be forced to make new carts. Thank you for your commission, William!